Styling my house for Christmas is something I have always loved doing, ever since I was a little girl and I used to help my mother prepare her house. I still have some of the decorations she used such as silver clip candle holders that belonged to her mum. Back then there was a lot of oasis used to make big show stopping centre pieces and hanging decorations and whilst I still use many of the same things to decorate my house as my mother did, I have evolved my own style. Apart from the decorations I have which have either been gifted to me or handed down through my mother and grandma, I now try to use only natural, foraged material to decorate my home. There is an abundance of foliage available at this time of year, we always forage for our tree and use berries, mistletoe and fir-cones to spruce it up. This year I treated myself to some beautiful flowers from The Real Flower Co, to add a little something special to the table. Whilst the roses aren’t from the UK at this time of year, they are grown sustainably on their farm in South Africa. You can read more about The Real Flower co here. 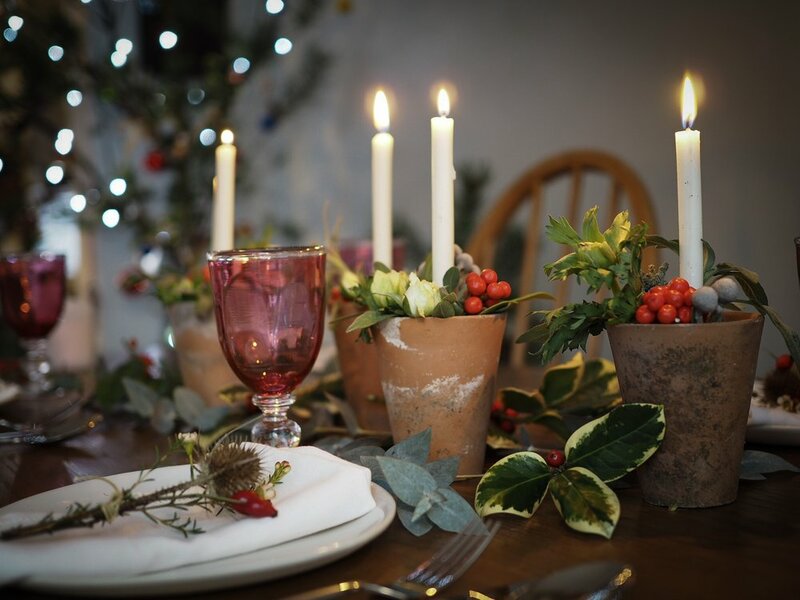 So let me share with you a few simple ideas of how you could dress your home this Christmas in a simple and more sustainable way. I’ve kept the tones for this first idea intentionally neutral in order to evoke a calm atmosphere and have then used candle light to bring some warmth to the green’s and whites. Using my growing collection of small vintage vessels I placed seven or so vases of varying sizes along the centre of the table, placing a rose or two in each vase, alongside a couple of spring of wax flower and sage and eucalyptus. In between the vases, I lay lengths of eucalyptus to link the vases together, I really do love the smell that eucalyptus releases, it signifies this time of year. Next I placed lots of candles in amongst the vases and tied small lengths of rosemary to hold my napkins in place. Overhead and across the centre of the table, I strung a length of hop string in between two hooks on the wall and carefully laid out lengths of eucalyptus and mistletoe, tying them in place with more hop string. I then strung a few glass hanging tea light holders from the string to sit just above people’s heads. Hanging something from overhead brings a little drama to the dinner table and can make you feel you are sitting outside rather than in. For this style of table, you can use so many different types of herbs for your foliage that are still available at this time of year such as rosemary, sage and bay. Its wonderful to have their smell fill the room. If you are unable to source roses then anemone and hyacinths would look beautiful as alternative choices. For this second idea, I went for traditional colours. Using mainly green and red tones, the finished effect is one of a much richer, warmer table setting. I used vintage terracotta pots and secured candles to the bottom of them by filling the base with sand and pushing the candles in. Then using holly berries, rose buds and sage I filled the empty gaps around the candle to make a pretty base. I laid variegated holly and eucalyptus amongst the pots to bring the table together. For the place settings, I made small poses of teasel heads, wax flowers and rose hips, tied together with some twine and laid on top of linen napkins. Overhead, I strung eucalyptus and Chinese lanterns to link to the table colours and again, utilised my hanging tea light holders. I get the appeal of wanting to invest in beautiful paper to wrap the gifts that you have given such thought to but it’s worth considering an alternative given that 4,000 tonnes of wrapping are used each year which equates to nearly 25,000 trees worth. That’s a lot of nature to be torn up and chucked in landfill or in the fire. So, this year I went wrapping paper and Sellotape free. Over the course of the year I have been saving any brown paper that my deliveries have arrived wrapped in (Amazon’s brown paper comes in perforated strips which is super handy for this!). With some careful tucking and folding I could use the firmness of the brown paper to wrap most things with relative ease. I then used some pretty twine to hold the package together and dressed them with mistletoe sprigs and wax flowers. Personally I love this understated look and am guilt free on the big day as the boys rip open their presents. Small things like this can help to make a difference to this world of ours. Will you join me this year and be wrapping free? Hopefully I have provided you with a few thought starters as you begin to prepare your Christmas table this year. Thank you for taking the time to read this blog post, I look forward to seeing your designs on Instagram, tag #botanicaltales to ensure I see them!